Winter celebrations leave behind a lot of extra trash—from holiday dinner leftovers to gift wrap and boxes and decorations for New Year’s Eve. We love to celebrate with friends and family. We love parties. We love to give gifts and send holiday greeting cards. 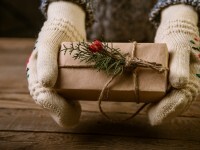 But we also love the Earth, so here are some ideas to make sure we take care of it during the holiday season by giving low-waste gifts. Offer the gift of service, like vacuuming out the car, cleaning the house, raking the yard, feeding the cat, or walking the dog. Shop at second-hand stores and select gently used gifts, such as books, movies, games, CDs, jewelry, or scarves. Create homemade gifts, like decorated picture frames or pinecone ornaments. Make delicious holiday snacks or baked goods or give a casserole that can be served later, on a busy weeknight. Give reusable gifts, such as lunch bags, water bottles, coffee mugs, or colorful cloth shopping bags. Give the gift of a fun, like tickets to sports events, museums, or other local activities. Thanks to Skagit County Public Works for sharing these great ideas!